Join Andrea Carter for more adventures in nineteenth-century California! The independent tomboy Andrea Carter and her beloved horse, Taffy, were first introduced in Andrea Carter and the Long Ride Home in 2005. Since then, popular author Susan Marlow has penned five more books in the Circle C Adventures series, filled in Andi's early years with the Circle C Beginnings series, and started a chronicle of Andrea's teen years in Circle C Milestones. 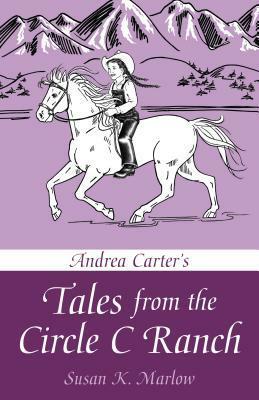 Published to celebrate the tenth anniversary of this positive role model for girls, Andrea Carter's Tales from the Circle C Ranch is a collection of short stories inspired by fan questions that fills in many of the gaps between Circle C Beginnings and Circle C Adventures. Taking place between 1873 and 1880, each story is prefaced by an explanatory note that pinpoints the action of the story in relation to events in the existing Andrea Carter books. Wholesome fun, and with a clear Christian message throughout, Andrea Carter's Tales from the Circle C Ranch is a must-read for fans of the series and a fun introduction for those who haven't yet discovered these historical gems. I do hate when posts disappear! I don't know how, but somehow this one did. Have no fear, though, I'm back to tell you all about this book...again. This book was a quick, easy read that made me want to go looking for all of the books in this series. While it's a children's book, that rarely stops me and this is the kind of series that I would have loved to have on my shelf when I was a child. Ms. Marlow writes in a down to earth style that had me turning page after page until before I knew it, the afternoon had passed and I was hurrying to go get dinner on the stove. This book is great for long time fans of the series, as well as newcomers. Fans will find references at the start of each story telling them right where they fit into the series. I don't know if I'm going to go out and purchase the other books in the series quite yet, but for sure, they're going on my wish list!